Save space with Seville Classics 10-Drawer Organizer Cart. Constructed with industrial-strength tubular steel finished in chrome, the cart features tall, easy-to-grab handles and a removable perforated steel top shelf. 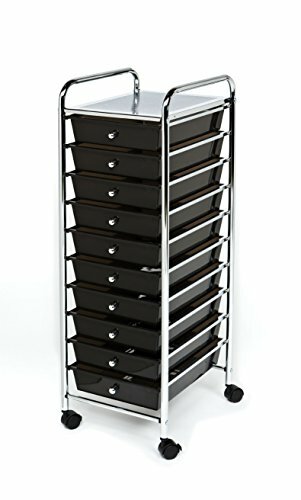 Cart includes 10 removable polypropylene drawers in an opaque black finish and chrome drawer pull knobs. The interior of each drawer measures 13.63 inches long, 9.5 inches wide and 2.5 inches tall. That's deep enough to hold a ream of printer paper with space to spare. Each drawer can hold up to 3.3 lbs. while the top shelf can withstand up to 16.5 lbs. Remove drawers and re-order them as needed for an organization solution that works for you. Create an organization system for any room in your home. Use it as a makeup organizer or as arts and crafts storage. Fill it with notepads, binders, staples, and other supplies next to your desk as an office storage cart. The cart includes four 1.5-inch casters with two that lock, so the cart goes where you need and stays where you put it. This convenient organizer is ideal for use in the dorm room, classroom, office, bedroom, bathroom, kitchen, garage or workspace. Seville Classics shelving is backed by a 1-year limited warranty unless otherwise specified. The warranty protects against original defects in material or workmanship under normal home or office use for the duration of the warranty period. Ohio Steel 4048PSD Heaped Poly Dump Cart With Swivel Dump, 12.5 cu. ft.